With Valentine’s Day just around the corner, I’d like to share an easy, sure success cake recipe that I have baked many times now. Besides being an easy recipe, there are couple of other reasons why I like this recipe. The first is that I can decrease the amount of sugar required and yet the cake will still turn out moist and decadent. The other reason is that my family really enjoy this no fuss Chestnut Torte! 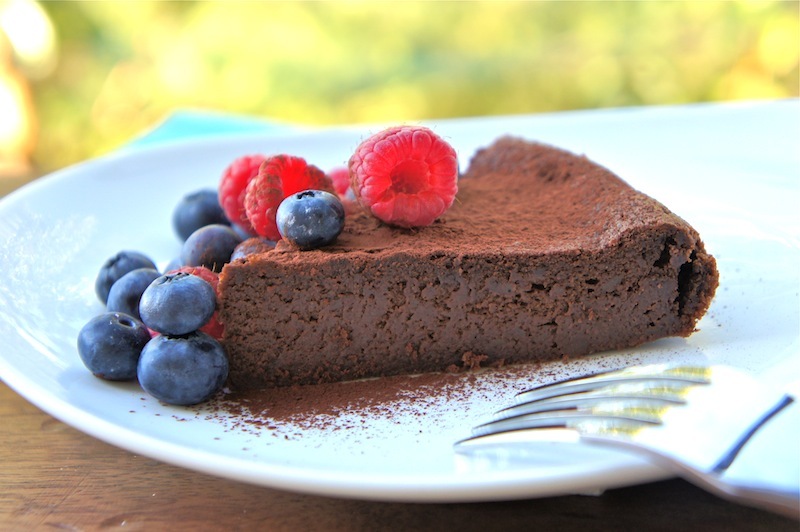 To serve, I would deck-out a slice of the cake with some fresh berries and several sifts of Varlhona cocoa powder. Here’s a suggestion, as, why not give this recipe a try? Enjoy. Position a rack in the lower third of the oven and preheat the oven to 375˚F/190˚C. Line the bottom of the cake pan (8 x 3 inches springform pan) with a circle of parchment paper. Place the chocolate and butter in a large heatproof bowl in a wide skillet of barely simmering water and stir occasionally until nearly melted. Remove from the heat and stir until melted and smooth. Or microwave on Medium (50%) power for about 1-½ minutes. Stir until completely melted and smooth. Stir the chestnuts, rum, vanilla, and salt into the chocolate. Whisk in the egg yolks, along with 6 Tbsp of the sugar. Set aside. In a clean, dry bowl, beat the egg whites and cream of tartar with an electric mixer at medium speed until soft peaks form when the beaters are lifted. Gradually sprinkle in the remaining 2 Tbsp sugar and beat at thigh speed (or medium high speed in a heavy duty mixer) until the peaks are stiff but not dry. Scoop ¼ of the egg whites onto the chocolate batter. Using a large runner spatula, fold them in. Scrape the remaining egg whites onto the batter and fold together. Turn the batter into the prepared pan, spreading it level if necessary. Bake for 25 to 35 minutes, or until a toothpick inserted in the center of the pan still has moist crumbs clinging to it. To serve, slide a slim knife around the inside of the pan to loosen the cake. Remove the pan sides and transfer the cake, on the pan bottom, to a platter, or invert the cake onto a rack or tray, remove the bottom and the paper liner, and invert again onto a platter. Using a fine-mesh sieve, sift a little powdered sugar or chocolate over the top of the cake before serving, if desired. Serve each slice with some mixed berries or whipped cream, if desired. What a cool recipe, I actually have some roasted chesnut in my freezer...would I just blend them or does the puree you buy have extra moisture? I am very intrigued. WOW! 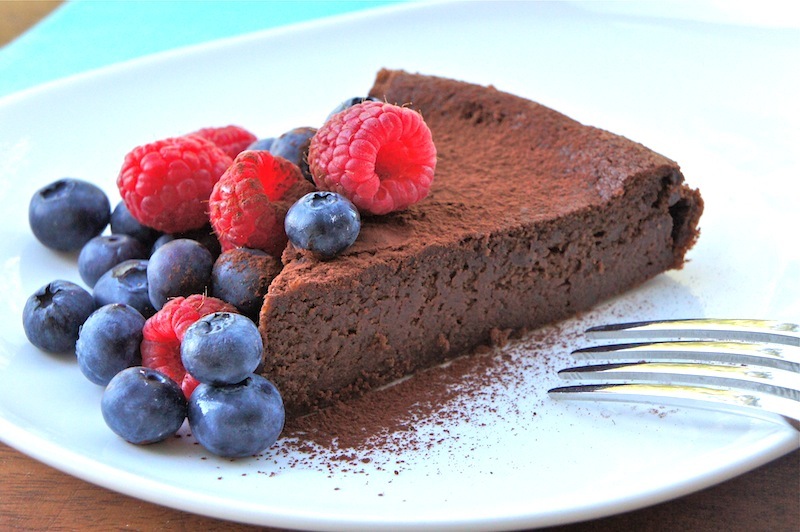 Looks so beautiful and you'd fool anyone into thinking its a chocolate torte! @Jennifurla: Just try to blend or mash the roasted chestnuts. I could be wrong, but, I don't think there is any extra moisture in the canned puree. Chestnut torte? Whoa, I've never heard of that before. It sounds amazing though, and I'd love to try it. Can I ask where you get the canned chestnut puree? I've never seen that before. This sounds delicious, and looks gorgeous! I love chestnuts and cakes made with them, so I am going to pick up a can so I can be ready to make this. Gorgeous photos! I love how dense and fudgy this looks. I really want to bake something with chestnuts before the season is REALLY over and this sounds perfect!